NEW YORK, NY – April 2, 2018 – A+E Networks is supporting 5 NYC-based graduate student teams to produce new augmented reality (AR) prototypes. In partnership with A+E Networks’ HISTORY brand, teams are working with AR technology platforms for mobile devices, such as Apple ARkit for iPhones, to consider how interactive storytelling experiences can explore the pivotal year 1968, connecting historical events to themes that continue to impact the present. With 2018 marking the 50th anniversary for the year 1968, the focus of the fellowship program stems from HISTORY’s current, year-long examination of the 20th century time period and the changes it brought to America. Over the course of 2018, a range of editorial content will be produced by HISTORY, including video, web features, interviews, social content and podcasts. In an application process structured by NYC Media Lab, applicants were asked to propose an AR storytelling concept of a crucial moment, event, or movement that took place in 1968. Participating teams were chosen based on their experience in rapid prototyping and design for immersive environments, as well as the strength and validity of their concept as it relates to ongoing content efforts of the HISTORY brand. Teams from three New York University programs each received a $5,000 award to complete the fellowship. Teams are currently meeting weekly at A+E Networks and are receiving mentorship from leading executives across the company as they continue to iterate on their concepts. In success, the projects produced by the fellowship may be included alongside the content efforts of the HISTORY editorial team. The fellowship will conclude in a special demo day event, taking place at A+E Networks on April 11. To explore the projects firsthand, RSVP to the demo day here, or contact Alexis Avedisian, NYC Media Lab’s Communications Manager: alexis@nycmedialab.org. An AR Experience that explores how media has evolved over the last 50 years, focusing on the annual U.S. State of The Union Address. Travel back in time to Washington Square Park through augmented reality, and join Wallace and June – two young activists on a 1968 spring day, in a cinematic experience. 1968 in Orbit is an interactive narrative around the first orbit of the moon. 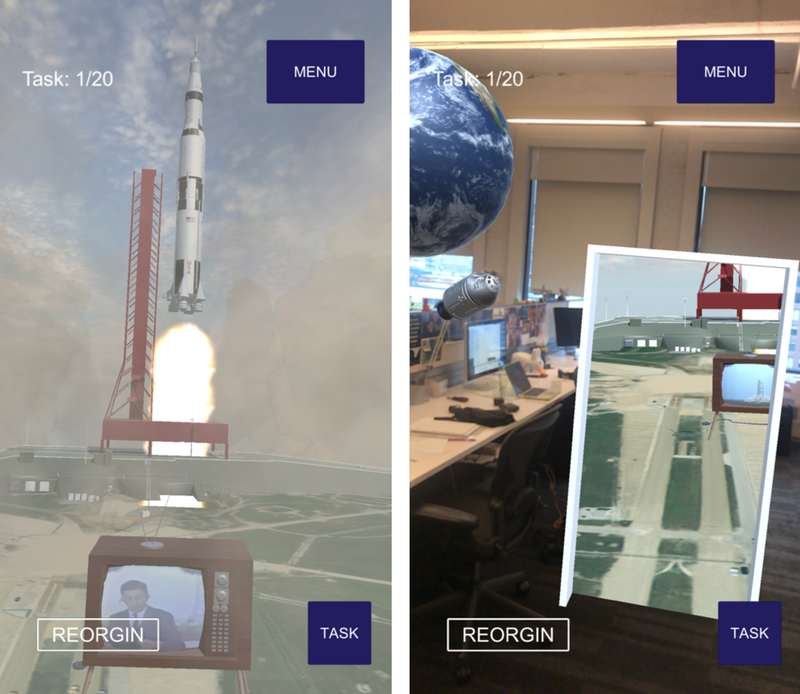 The experience leverages ARkit to bring the experience of space exploration into the audience's own environment. The augmented reality experience explores the significance of Douglas Engelbart's NLS invention, first presented in 1968 and its connection to the modern times through simple spatial puzzles, narration and archival footage. A series of multimedia projects, each incorporating either written language or film with an augmented reality component focusing on a variety of important moments of the collective international student uprising of 1968.